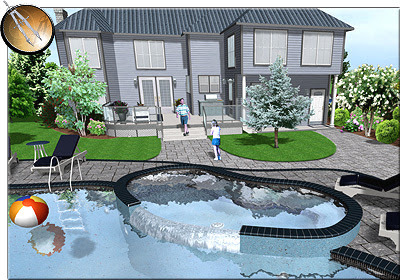 [ reviews section ] Realtime Landscaping Architect 2011 is software that you can use to design a house like what you want, very easy to use because it comes with a graphic user interface is quite friendly, supported with 3D graphics technology, which will make your home design look real, see your landscape design ideas come to life with surprisingly realistic lighting, shadows, flowing water, and other effects, just like in real life. Realtime Landscaping Architect 2011 really very good house desgin software, with Realtime Landscaping Architect 2011 software you can also use for design decks, design Fencing, design yards, design gradens, design swimming pools, and many others. Realtime Landscaping Architect 2011 includes over 16.000 objects, including 6700 plants and 3000 accessories. with using Realtime Landscaping Architect 2011 software, design a house more easily because it has been equipped with a wizard that can generate the design of the house instantly, you can also easily include additional design such as doors, windows, light porc, and others. some things that you would get at Realtime Landscaping Architect 2011 software include, Professional Presentation Tools, Automatic Plant Legends, House Design Made Easy, Automatic Plant Legends, Advanced 3D Graphics Technology. Realtime Landscaping Architect 2011 software you can use on computers running Microsoft Windows operating system, Realtime Landscaping Architect 2011 software on sale for USD 349.00.